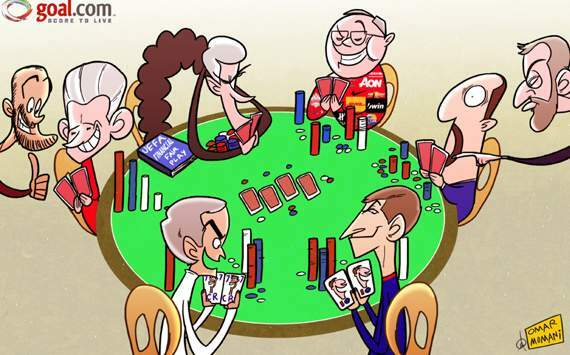 Cartoon of the Day: Which of Europe's card sharks is holding the aces this year? Stick or twist? That’s the real question as Europe’s top bosses limber up to do battle in the second half of the season – even if they all seem to be playing their own game. Will Arsene Wenger Go Fish this January? Who’d win in Top Trumps if Jose and Tito laid their star cards down? How long before Roman increases the tension on Rafa before he hears that all-too-familiar Snap and finds a new willing victim for Bridge? Can Pep, er, pep up the Bayern players after the upcoming depature of Old Maid Jupp? And will Sir Alex Beggar My (noisy) Neighbour to reclaim the Premier League crown? Which of Europe’s card sharks is holding the aces this year?